DAVID&SCHWEITZER Contemporary is proud to present Daniel John Gadd’s first solo exhibition in New York City, For The Moon, as our inaugural one-person show. At only thirty years of age, Gadd is making some of the freshest abstract painting of the day. While elements of his work reference the great history of abstraction found in the gesture, sexuality, and lushness of de Kooning, the transparent use of color and the palette of Diebenkorn, the shaped formats of Stella, the fragility of Tuttle, and the objectness of Ryman, Gadd combines these elements to drive his work outside the box, so to speak, breaking the formal confines of the rectangle and creating a narrative that is deeply personal and universal at once. The title of the exhibition, For The Moon, refers to Gadd’s daughter’s nickname, and to how her birth has brought a “centering “ to his life. 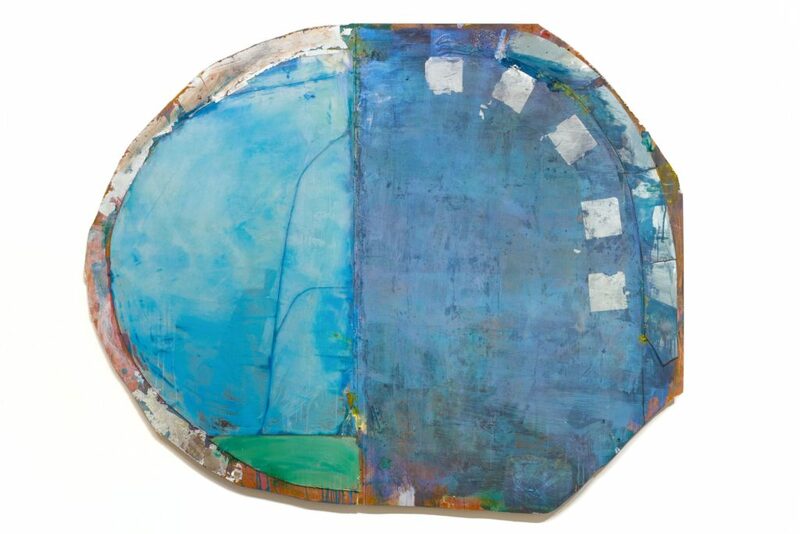 The use of the tondo or imperfect circle is Gadd’s way of trying to make things whole, by taking all of the disparate parts of his life—his histories, his pain, his triumphs, his losses, his past, his present and his future—and making some sense of it all, a beautifully terrible reconciliation and acceptance of the fact that there is no such thing as perfection. Gadd’s work is fragile, violent, aggressive, athletic, and painfully sensitive, all at once reflecting—literally, with his use of mirrors—that “human dead center” noted by Rosenberg. Gadd seizes upon, fractures and reconfigures the complex range of what makes us most human, reassembling it all into balanced wholes. The artist’s “centering” of his world around his daughter Moon is also the beautiful core at the center of For The Moon. In our Project Space, concurrent with Gadd’s exhibition, we will be presenting a series of intimate and delicate watercolors by Benjamin Pritchard that served as studies for his larger more muscular works. We will also be exhibiting a larger oil painting as well. Pritchard’s work, most recently the subject of a one-person exhibition at John Davis Gallery in Hudson NY, creates languages differing from painting to painting, with the constant being the passion with which they are painted and the enigmatic language that passion creates. The work lands in an unintentional form of a self-portraiture, combining the painterly elements and surface found in ABEX and a more personal narrative akin to some of the dream state imagery found in Aboriginal Art. The works achieve a singular state of a split-consciousness with an exquisite and finely tuned state of irresolution.